Bukit Dumbar Villa is a low-density development project with only 64 townhouse units in total. These low rise townhouses has a central courtyard which is well landscaped. Each townhouse has a spacious built-up area ranging from 1,700 to 3,160 sq.ft. 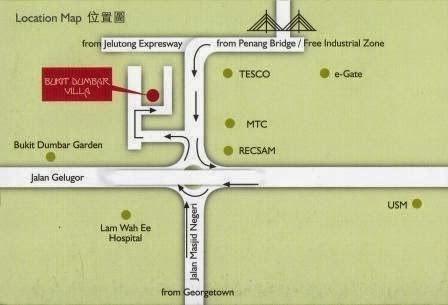 It is strategically located at Gelugor within walking distance to Tesco Jelutong and e-Gate. Bukit Dumbar Villa is easily accessible and just 5 minutes drive away from the Penang Bridge. Built-up Area : 1,700 - 3,160 sq.ft. Does anyone knows when this project will obtain the O.C? Does anyone knows the price? What is the price like ? Any idea what's the price range like? The location perhaps is the biggest selling point of this development. No traffic problems almost to every where. E-gate & Tesco is just stone's throw away. 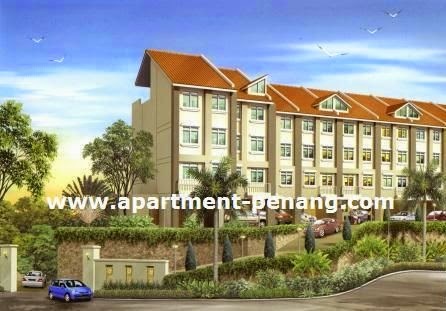 Not forgetting easy access to Penang bridge & Georgetown. However facilities provided are merely basic like Intercom guardhouse & lift to upper floor (do take note that this is only a 5 stories building). No swimming pool, Gym or other common facilities that normally a Condo project would have provided. For your information, it's a Freehold project. anyone visited the show house? yeah first time hear about this project, anybody have any clue where's the showroom and price range? thanks. Developer launched price was in the range of RM400k - RM767k. Current price is unsure, all depends on the sub-sale condition. Shall be in the range of RM270-RM300psf. anyone know where is the office and showroom? is it sold out? how much is it? The project was quite low key. I found out through word of mouth. I've checked out the place. No doubt the location is excellent, but personally, I didn't quite liked the layout, no view, balconies are facing other units to name a few. Not sure about the lanscaping, cause I entered from a side entrance, I don't see much greens. I think there should be about 4 unit types (can't recall). The smallest starts from 1700sf (at RM500k+ range - this i heard sold out, per developer), 2300sf (RM600k+ range), 2600sf (RM700k+ range) the prices are estimates, I lost my notes on that. You can contact the developer - Medal Rank for viewing @ 04-3700813. THeir office is at Stallion Aparments (Jln Tunku Kudin, u can see the building). Just a walk across from Bukit Dumbar Villa. Bukit dumbar area is a silent place at night and is good for own stay. The place is also adjacent to the popular Bukit Dumbar hill, a well known place for relax, jogging and exercise around the gelugor area. This are the comments received from most of my friends staying at Bukit Dumbar area. Just my 2 cent. This is a junk developer, I will not buy from them, just ask around their previous project. Hi KP, mind to share more on your claim about this 'junk' developer? No pun intended. Any buyer here to share your experience for this project? VP for this project obtained. OC obtained already this week, it's selling like hot cake now with subsale P&A signed within a week! is there a maintainance fee since this is considered a town house? how much is it per month if yes? April 20, 2010 at 5:48 PMTan H.H. Hello Sanz - do you have the layout of the townhouse?